DescriptionTravelling to Paris with a young baby? Enjoy the visit with the Babyzen YOYO newborn stroller: light, compact and comfortable it can be used anywhere in Paris (including public transportation). • Exclusive «soft-drive» system: no need to lock the front swivel wheel, even on rough terrain. Delivered with rain protection and carrying bag. 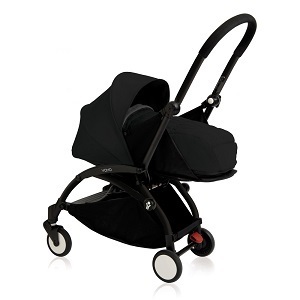 You're looking to purchase a Babyzen Yoyo stroller in Paris? Contact : large range of quality baby gear products and advices (5 stores in Paris and Vincennes). Fixed delivery and collection fees: 20 € for Paris and surroundings (extra fees apply for CDG and Orly airports, train stations, Eurodisney, departments 77 and 91). Delivery and collection fees offered for any booking above 120 € (Paris area - not applicable for airports, stations, departments 77 and 91). Need to rent a stroller in Paris for more than 1 month? Contact us for a specific quote. On request of our customers, we've now added this newborn Babyzen YOYO pram to our baby equipment rental. Sarah (in March 2017): "We had the best experience renting with Baby'tems! We made a last minute reservation when I decided to join my husband on a business trip in Paris. Ordering online from the US was simple and straight forward. The pram we rented was in such great condition it seemed brand new. It was perfect in the city with our 7 week old. It was waiting for us at the concierge of the hotel we were staying at and when we needed to adjust the pick up time they were flexible and prompt in getting back to us. It was so nice not to worry about bringing our own baby gear through the airport, etc. Thank you for a great experience!" Elena (March 2016) had a Babyzen Yoyo newborn pram delivered to her hotel: "Great service, recommended exactly what I needed & we loved traveling light because we found this service ! The stroller was clean and super easy to roll and fold - perfect for a big busy city like Paris."